Doll news may be posted either by fans or by the artists themselves. 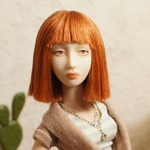 News may pertain either to porcelain BJDs themselves or to accessories created especially for them. Please use common sense when deciding whether to make a new thread or add to an existing one. For example, you might start a new thread to announce a new doll sculpt, the release of a new collection, or the beginning of a sale. A reminder that a sale is almost over, however, would be more appropriately posted in the same thread instead of creating a new one. Please try to make your News threads as informative as possible! Of course you may post a link to the artist's website or blog, but please also include enough information that we can see what the news and why it is exciting without clicking on the link.